I'm fairly certain you've all played a game with glowing blue goo. And, if you have, I'm very certain that it was important to the plot of that game. For whatever reason, writers, artists, and designers seem to like to use the cerulean cesspools to the point where they're becoming a trope. I'd like to cross-reference all of our blueberry mcguffins to see if we can find some common threads. Ideally in a color that contrasts with blue. All of the Sheikah structures in Breath of the Wild seem to exhibit a bright blue glow. 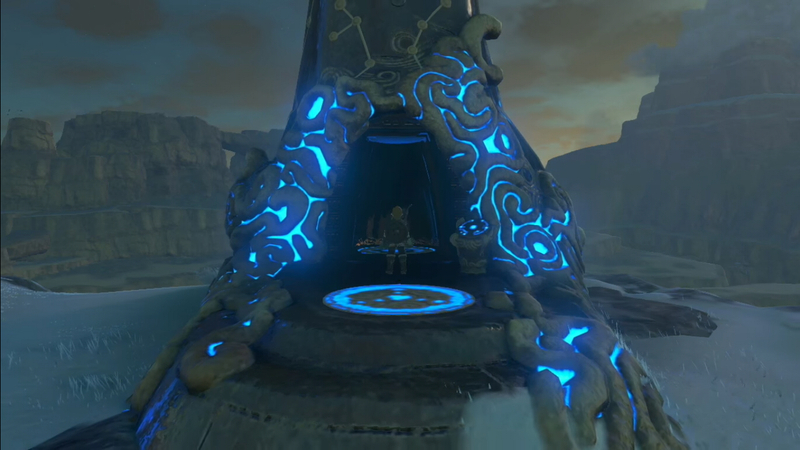 Specifically, all of the Shrines of Trials and towers glow orange until you authenticate your Sheikah Slate at their entrances, then they switch to blue. Also blue-glowing are the shrine interiors and Sheikah Slate's runes, as well as the pool that drains after Link awakes in the "Shrine of Resurrection." For all we know (the game obviously not being out yet) the glowing blue could simply be how normal electricity appears and the Shrine of Resurrection merely a pool of colored water. And yet, it's intriguing. Monster Hunter Generations: Nakarkos'... Blood? This is a minor one. Nonetheless, the big final boss monster of the game, Nakarkos, produces a viscous blue substance that it fires at prey from its tentacles in powerful jets. The sticky glue binds the limbs of prey, causing flying creatures to plummet to their deaths. Nakarkos also excretes the blue goo glue (say that 10 times fast) from its skin to gather the bones of its prey in a kind of dynamic shell. Hunters see a microcosm of this if they become covered in the cerulean gunk and roll across the monster's bone pile, becoming coated in the bones and immobilized themselves. Lastly, it's blood is also blue, though it's unknown if that is the same blue substance or merely a similarly-colored one. This is the big one. Both biotic and abiotic, like molten lava, but cold, phazon is a central plot element in the Prime Trilogy. Both highly hazardous and a potent mutation agent, the bright blue fluid propagates itself by infecting other creatures. In fact, phazon is perhaps a bigger secondary antagonist than Ridley himself (spoilers for the trilogy follow). The planet of Phaaze is itself a large, phazon-based organism. Long ago, it sent a leviathan carrying large amounts of phazon to Tallon IV which poisoned the water, mutated indigenous creatures, lead to the extinction of Chozo life on the planet, and even corrupted their ghosts (okay that last one admittedly doesn't make sense). Leviathans are organisms born within Phaaze and matured on phazon. They are capable of interstellar travel via the wormholes they create, intended to impact into distant planets, corrupt their ecosystems, and eventually create clones of Phaaze itself. Leviathans possess both a phazon core and a guardian: an indigenous predator which has been mutated by phazon to grow stronger. In the case of Tallon IV, the Chozo erected a barrier around the the leviathan's impact crater, fearing guardian they knew as the Worm which had been born of a parasite. Within the long-sealed impact crater, the phazon had festered and grown yet stranger, turning red while large bone-like structures looming inside the normally-vibrant leviathan seed. At its terminus Samus defeated Metroid Prime, a metroid inducted and mutated into the leviathan's guardian. However, as its phazon form was growing unstable and the impact crater loosing its form, Metroid Prime lashed out and stripped the Phazon Suit off of Samus. Metroid Prime mutated once more, mimicking Samus' form, its sentience swelling. Eventually this Dark Samus would become the guardian of Phaaze itself. More recently, a leviathan impacted into Aether, splitting the planet into two dimensions. Most notably, it created the Ing life forms. However, unlike other leviathans, the ing were not corrupted creatures, but rather creatures born of phazon that grew and evolved in the new dark climate. On Phaaze they were known as Phaz-Ing and look like animated pools of phazon. Furthermore, after Dark Samus was defeated on Aether and took control of Phaaze, leviathans were sent to Bryyo, Elysia, and the Space Pirate Homeworld. The space pirates embraced the phazon's powers as they had on Tallon IV, experimenting and weaponizing phazon as red, purple, and green lasers. They even augmented a second leviathan seed with their technology, turning it into a battleship. On Elysia the phazon seeped into even the Chozo's mechanical guardians, corrupting their purpose. The interiors of these recent phazon seeds were much more vivid blue and lush, highlighting the ability of phazon to create life purely from itself. Anyway, I'd like to hear more evidence about other games' blue goo from those who know them best. Explanations of stuff like the Lifestream would be great. I think the Sheikah Magitech is supposed to resemble fantasy electronic circuits, not goo. I'll give you the pool Link wakes up in though. @Mbun I was trying to be a bit inclusive with my definition here. Blue-glowing stuff in general seems to demarcate importance, but blue goo seemed like the trope's most common expression. It's just that, once you get into etherial blue-glowing liquid, it has a great tendency to switch between a corporeal liquid and insubstantial "pure energy" form. You can see this a fair bit in Metroid Prime's phazon troopers.